Our story takes place within the picturesque hills of Central Vermont. 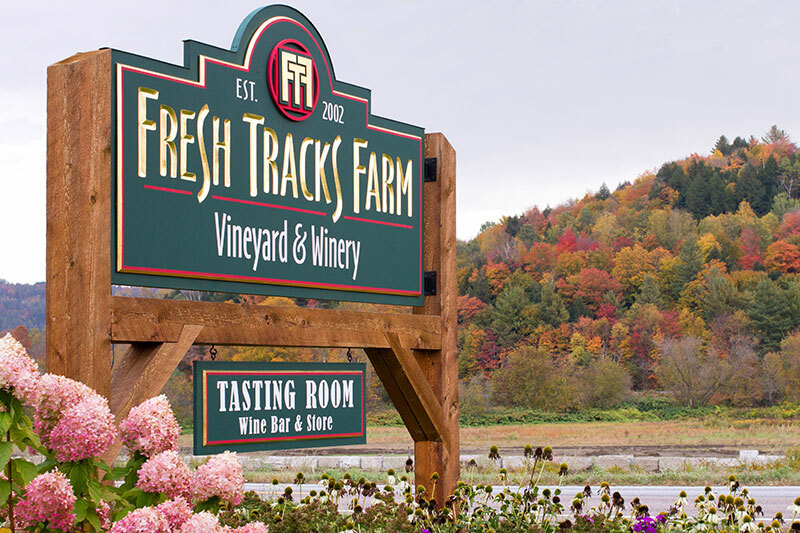 Fresh Tracks Farm was founded in 2002 with the goal of crafting authentic Vermont wine in a beautiful yet challenging climate. Owner and winemaker Christina Castegren sought to build upon her knowledge of agriculture, and fulfill her passion for working with the environment around her. She and a team of colleagues and friends spent years preparing fields, constructing trellises, gathering equipment, and planting vines. Of the seventeen original varieties, only 6 remain, with an addition of 3 new varieties planted in the summer of 2017. In 2006, we produced our first vintages of Little Piggy Pink, Vermont Rosé, and Frontenac Gris. During this period, we ventured into maple syrup, grape jam, and red wine vinegar production as well, and it all took place in our little red barn up on the hill. After several years, we finished construction on our tasting room and production facility along Route 12, and in 2009, opened it to the public. Making great wine requires a great team. Here at Fresh Tracks Farm, each of our respective skills and interests provide the overall foundation of our business. We take our passion seriously, and it is with great pride that we share it with you! Honesty and hard work will always culminate in a quality product. Interested in the Vermont wine business? Click here to see our current job openings. Though producing wine is our primary business, we love all other facets of the farm life. We make use of Fresh Track Farm’s many natural resources in a way that supports the land’s overall health, and recognize the importance of keeping our ecosystem in balance. We sustainably harvest firewood and timber throughout the year; tap 1,000 maple trees for syrup and our authentic Maple Wine; and cultivate flower and vegetable gardens, compost piles, and seedlings in our greenhouse. If we’re ever in need of some friendly company, our brood of egg-laying chickens, horses (Mr. P and Colleen), farm dogs, and barn cats are always nearby. Sustainable farming is important – especially in Vermont. We believe that how we live on the land has a direct impact on what we receive from it. That’s why we use renewable sources like geothermal and solar energy to heat, cool, and power our wine facility. We also draw on a variety of natural farming principles, and work the land with a respect for both science and tradition to foster healthy growth. For us, sustainability is also about running a business that we can feel proud of. We strive to provide value to our community, a high quality product to our customers, and a positive working environment for everyone here at Fresh Tracks Farm. Since 2002, we have been planting, removing, and retraining countless grapevines on our three vineyards. These sites subsist of all have different soil and geological profiles, in addition to varying elevations and orientations. These factors give us a diverse range of characteristics to work with in the winery. Our process at Fresh Tracks Farm follows a cyclical pattern throughout the year. We’re always wonderfully busy, but most importantly – we enjoy the diversity of our work life. In the Winter, while the vines lay dormant, we reflect on the past season and plan for the next. It’s the perfect time for maintaining equipment and reviewing ways in which we might improve our efficiency. Life in the winery is busy, too. Barrels are emptied and refilled, wines are blended and refined, and plans are put in place to assure that we’ll have enough tank space for the new vintages. Up on the farm, we tap maple trees, stack wood, and – just as the winter starts to thaw – we make our way out into the vineyards to prune back the grapevines. In early Spring, while hidden away from the muddy roads and chilly winds of a fading winter, we bring buckets and buckets of sap down to our roundhouse for boiling in our wood-fired arch. Not only will we produce deliciously sweet maple syrup, but we also produce a concentrated batch for our signature maple wine. Soon after, when the warmth of April and May waft across the state, tender buds start to appear on our grapevines. We witness our vintage come to life in the form of flower clusters, tucked inside the newly emerging shoots. There’s a lot of compost-spreading and the collection of vine clippings also to be done. Summer is spent combing, tying, and adjusting the vines so that the fruit stays evenly exposed to the sun. We bottle new vintages, taste different blends, and tend to our gardens and flowers up on the farm. In the tasting room, we sample out wines, educate guests about our many varieties, and provide fun and engaging events for all to enjoy. In the Fall, is harvest. A period of three to six weeks where we traipse across every inch of our vineyards, snipping bunches of grapes away from the vine, loading them onto a tractor, and crushing them into juice down in the winery. Our winemakers immediately begin transferring the juices into various individual tanks, while everyone else continues to collect the remaining grapes. It is easily one of the busiest times of year for us, but there the feeling of satisfaction we get once the harvest is complete makes all the hot, tiring afternoons worth it. Watch a tour of our tasting room & vineyard. POSITION SUMMARY: This position is responsible for ensuring that customers have a positive and memorable experience at Fresh Tracks Farm Vineyard & Winery. They must have a passion for wine and be open to learning the details of the wines we produce and our general operations. Responsibilities include: Greeting customers promptly and courteously; guiding customers to wines they enjoy; setting up and cleaning up daily operations and special events; stocking wine and retail merchandise in the tasting room; accurately performing daily wine inventory and money handling procedures. This position requires you to be at least 21 years of age. WEEKENDS REQUIRED. Please email the tasting room manager if you are interested.